Although boreal forests occupy vast areas, the diversity of species is rather poor. There are about 300 tree species in all but only about 30 occur widely (Isaev et al., 1995). Forests composed of Larix sibirica, L. gmelinii (the previous name of this species is L. dahurica) and a few other species in this genera are the most extensive and cover about 263 million hectares east of the Yenisey. Being very undemanding to climate, Larix forms the northern tree line across most of the area and extends southwards to the dry steppes. It is Larix forests that develop in the coldest place in the Northern Hemisphere, the Verkhoyansk region, and grow on the permafrost. Under favourable conditions, Larix trees can live for over 300 years, reaching about 50 meters in height. However, the severe climate of the northern taiga subzone and Eastern Siberia act adversely on Larix and it rarely reaches a great size there. Other common forest-forming species are Picea spp., Pinus sibirica, Abies sibirica, and Pinus sylvestris (Table 9.1). Picea is the second most widespread taiga tree species whose centre of origin is in China. Two species prevail: Picea abies in the central and northern East European plain and P. obovata in northern European Russia, Western and Central Siberia, and the mountains of Southern Siberia. Further east in southern Sakha-Yakutia and the Pacific sector, Picea ajanensis occurs. Although a humble species, Picea is more demanding of the quality of soil than Larix, particularly of the upper horizons where its shallow root system develops. Abies trees, which often exceed 60 m in height, seldom form monodominant communities. Most widespread is Abies sibirica which is an important forest-forming species in the more humid locations in the north-east of European Russia, in Western and Central Siberia, and in the Far East. The largest territory, over 10 million ha, is occupied by Abies forests in Western Siberia where they extend from north to south for over 1700 km. There are a few species of Pinus. Pinus sibirica grows in the Urals, Western and Central Siberia; Pinus koraiensis covers about 4 million ha in the Far East; dwarf Siberian pine Pinus pumila is particularly common in the mountains of Eastern Siberia, the Transbaikal region and in the northern Far East. However, the largest areas are occupied by Pinus sylvestris which is not a typical taiga species but a tree that grows in various environments from the Baltic coast to the Pacific, from poorly developed sandy and rocky soils to the peat bogs with a standing water layer of 20-50 cm. Large areas within the coniferous forests biome are occupied by small-leaved deciduous species Betula and Populus tremula. The taiga species have adopted to low temperatures, sharp seasonal contrasts in temperature and humidity, a prolonged period of snow cover, and seasonal freezing of soil. 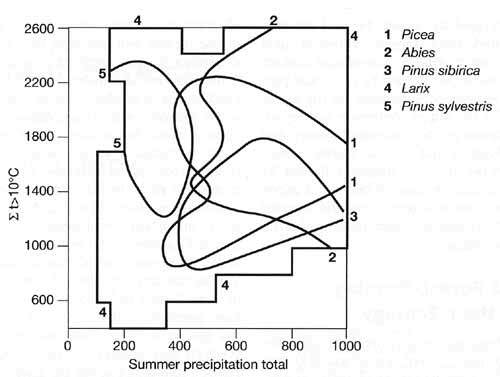 Among tree species, Picea and Larix (particularly Larix gmelinii) are best adapted to the extremely low winter temperatures (Figure 9.1), while Larix gmelinii and Pinus pumila best withstand aridity and sharp seasonal temperature contrasts. All conifers in the boreal forest biome are evergreen apart from Larix which sheds its leaves annually. Because no time is required by the evergreen conifers to develop new foliage, they use most of the growing season which is limited to about 30 days in the northernmost regions and 120 days in the south (Walter, 1985). Conifers begin photosynthesis at relatively low temperatures and have low light requirements although growth can be limited if the trees are unable to take moisture from frozen ground. Most of the coniferous forests are located within the permafrost zone. The distribution of tree species depends on permafrost conditions and most importantly on the thickness of the active layer (the layer of ground which is subject to annual thawing and freezing). The areas with a thin active layer of 50-100 cm are populated by Picea and Larix which have very shallow root systems confined to the upper 20 cm of soil. Other coniferous and small-leaved deciduous species have deeper root systems and require habitats with a deeper active layer. In the coniferous forest zone, soils are relatively infertile. Nitrogen is recycled in the ecosystem through the decomposition of litter at a slow rate because conifer litter has high concentrations of wax, resin, and lignin, which restricts the activity of microflora (Millar, 1974), and because low temperatures and permafrost slow down the return of minerals (Cole and Rapp, 1981). Mosses, abundant in boreal forests, create additional nutrient stress. First, mosses insulate the ground and decomposition is therefore reduced because of low soil temperatures (Van Cleve et al., 1983); second, they absorb moisture and nutrients and less minerals are delivered to the tree roots below (Oechel and Van Cleve, 1986). In contrast to the cold tundra soils, the taiga soils are dominated by microscopic fungi that play an important role in the decomposition of dead phytomass. The acidity of a soil aids the destruction of its mineral components and the washing of minerals into the lower horizons inaccessible for tree roots. Therefore, infertility of soil is compensated for by the easier access to organic nutrients due to the activity of microorganisms in the upper soil horizons where root system develops. As a result, in the taiga high phytomass reserves with low ash content form (Bazilevich and Tishkov, 1986). Parasites (mosquitoes, midges, horseflies, etc. ), which are abundant in taiga, also participate in the microelement cycle by transporting ash elements and nitrogen from floodplains and water bodies to the watersheds occupied by coniferous forests.